UPDATE: WE HAVE OUR WINNERS! Tiffany Miller and Bobbie Sicaju, please check your emails for details on how to claim your prize. Congrats, and thanks to everyone else who entered! Giveaway alert! We’re giving away TWO fashionable shower caddies, both filled with four limited-edition designer cans of Skintimate shaving cream. 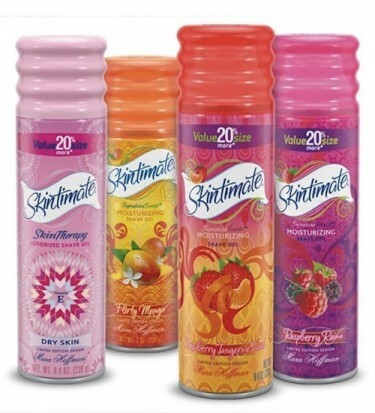 The scents include: Flirty Mango, Strawberry Tangerine Twist, Raspberry Rain, and Skin Therapy. New York Fashion Designer Mara Hoffman designed the collection, which "reflects both my unique and colorful design sense with the signature Skintimate aesthetic" to "instantly add a little style to your daily shower routine," she says. In order to enter for your chance to win, leave a comment below with your name and email address. Or you can also click here to enter on our Facebook page (we’ll be posting the contest every day this week).